The ‘sharing economy’ is the notion that people (and businesses) can generate income from under-utilised assets, by sharing them on a peer-to-peer basis in exchange for cash. Where sharing Hollywood movies is considered piracy, sharing access to your own car or spare property is an income-generating opportunity for many consumers — so brilliantly evidenced by existing sharing economy posterchildren, such as AirBnb and Uber. Airbnb is wooing the market because it is able to achieve sales revenues and commercial results, without owning the underlying goods used to generate the sale in the first place. Airbnb was recently valued at $31 billion , rivalling the largest hotel chains in the world (InterContinental Hotels Group and Hilton Worldwide) — and all without owning a single hotel or rental property. 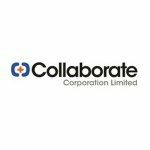 Collaborate Corporation Limited (ASX:CL8) is bringing its concept of ‘the sharing economy’ into commercial reality, by putting its collaborative business plan into action in Australia and has set up several cornerstone brands to do so. Several partnership deals with companies such as Subaru and most recently a $1 million strategic investment by RACV for a 5.38% interest in the company, has enabled CL8 to meet key performance metrics. The recent exercise of 100% of CL8O options that expired on 30 April 2017 raising $3.5 million, has also enabled CL8 to enter a new stage of development and further scale its technology platform. Thus far its results are bearing out rather nicely. CL8 recently recorded a revenue boost of 117% year-on-year, and a month-on-month improvement of 6%. With CL8 building momentum and sales revenues, cashflow positivity is not a million miles away. Collaborate (ASX:CL8) is adamant that everyday people can do more with their existing assets, including cars, caravans, tools and property. The premise behind the $24.7 million capped CL8’s business idea lies in the fact that most people tend to let their valuable assets depreciate without doing much about it. ...and now there is something they can do about it. CL8 has set off on its gradual growth spurt which has a chance of ramping up given the factors playing into CL8’s hands. As you can see, CL8’s upward trajectory is evident in both month-on-month and year-on-year readings. Compared to March 2017, April saw CL8’s DriveMyCar business unit increase its total transaction revenue by 6% and more than doubled its transactional turnover (+117%) since April 2016. These growth numbers underline the fact that CL8’s peer-to-peer brands are a hit with consumers, although it will take time for CL8 to breakeven and reach cashflow positivity. One key development recently seen at CL8 is its partnership with the Royal Automobile Club of Victoria (RACV) — Australia’s largest and most prominent breakdown service with over 2 million customers and wielding several brands that are perfect for the sharing economy. RACV has decided to invest $1 million in CL8 in exchange for a 5.38% stake. The deal was done at a 20% premium to the previous closing share price. News of RACV’s investment was well received by investors and CL8’s share price increased by over 60% upon publication of the news. Of course it should be noted here that share trading patterns should not be used as the basis for an investment as they may or may not be replicated. Those considering this stock should seek independent financial advice. Looking beyond the financial benefits of RACV’s investment, the partnership will see the two enterprises jointly realise peer-to-peer rental opportunities. RACV can honestly be called the quintessential Aussie brand, with very high brand recognition and extended reach across Australia. CL8 and RACV are incredibly complementary brands that ooze synergy from the get-go. For RACV as a company, there are a number of benefits. Its members can benefit from being able to make money from cars, caravans and other items they own but are not using and on the other hand members can also access these items at much lower cost than traditional rental companies. By leveraging CL8’s products, RACV can also appeal to a younger demographic which is more likely to rent items instead of buying them. RACV’s goal is to provide industry-leading mobility, home and leisure services to its members which aligns with CL8’s DriveMyCar, Mobilise and MyCaravan. RACV and CL8 have struck a long-term partnership aimed at maximising each other’s strengths. CL8’s Mobilise.com brand will now have a firm platform from which to attract new clientele. CL8 joins other prominent brands offered by the RACV suite of products, including Melbourne Bike Share operated on behalf of Public Transport Victoria and RACV Car Share, powered by Thrifty. All in all, we see CL8’s deal with RACV as part validator and part catalyst. The validation comes from the fact that one of Australia’s leading brands picked CL8 as its peer-to-peer partner, as opposed to someone else. The catalyst is the 2.1 million existing RACV customers who will be offered CL8’s products and services. According to CL8’s plans, the first ‘commercial initiative’ will be launched in Q3 2017 — that’s only a few months away. 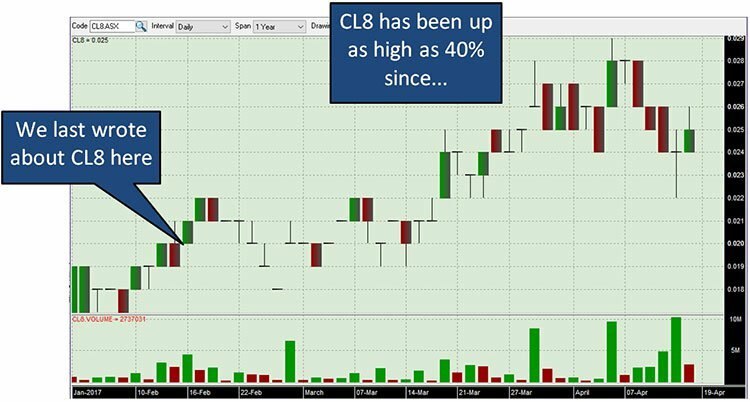 We could see CL8’s growth numbers taking a severe ramp upwards over the coming months, after CL8 and RACV have had a chance to target portions of their respective client bases. CL8 is in good company with RACV and we’re looking forward to what these two quintessentially Aussie companies can achieve together — so watch this space. As with all Tech stocks these days; funding is of paramount importance. On this front, CL8 has done a great job keeping its cash register well stocked. Just recently, CL8 confirmed that its option holders had exercised 100% (175 million) of the CL8O options that expired on 30 April 2017. This mean that a total of $3.5 million was raised, thereby paving the way for more expansive efforts such as new staff, operations, offices and product tweaks. Combined with the $1 million investment by RACV, this leaves CL8 well-funded to pursue growth opportunities, and very importantly for small-cap investors, reduces the likelihood of CL8 having to raise any more money. 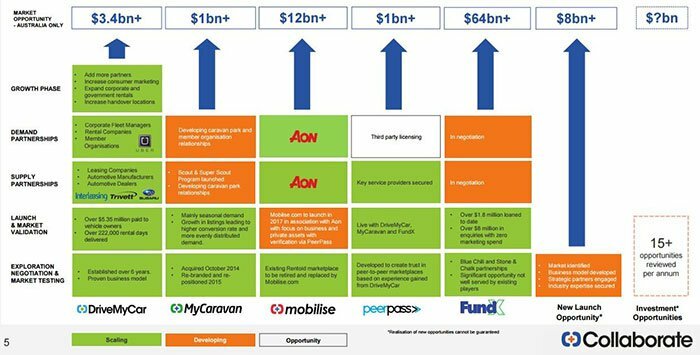 It is interesting to note here that one of these growth opportunities is CL8’s Mobilise.com launch which is just a few months away. Mobilise.com is an online one-stop-shop for rentals with an upcoming launch very likely to beef up CL8’s overall customer numbers. CL8 is not hanging around waiting for the sharing economy to develop. It is actively building its infrastructure that will facilitate its long-term growth plans and gradually proving that there is money to be made from sharing. In today’s modern times, making money from something you don’t use, is proving to be a superb business idea made possible by tech innovation. ...and hopefully, many more brand collaborations in future. CL8 is hoisting the P2P flag up the commercialisation flagpole, with the wherewithal of advancing its $24.7MN market cap in the coming months. Whether it does so or not is speculative, so investors should seek professional financial advice if considering this stock for their portfolio. 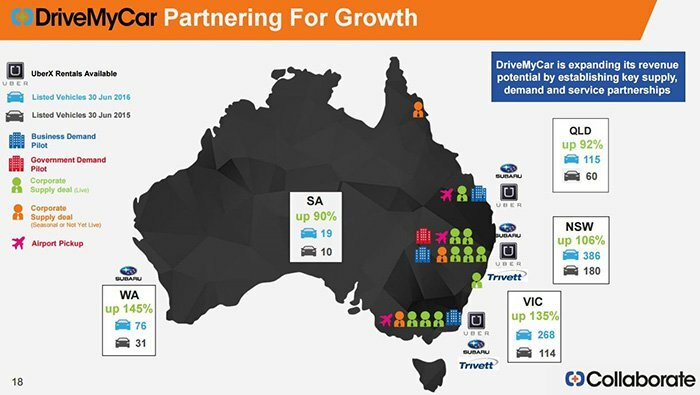 Providing wind to its sails is the prospect of two primetime product launches later this year — Mobilise.com and a co-branded DriveMyCar service for RACV’s 2.1 million members; both are due to hit the market in Q3 2017. In its current phase, the ‘sharing economy’ resembles online shopping, when it first made its internet-powered market debut in the late 1990s. At first, people were worried about security — but having made a few small successful purchases, they began to trust the concept and felt safe buying elsewhere. Eventually, after enough transactions went through without any hitches, people caught on to the fact that online shopping can be a great benefit. 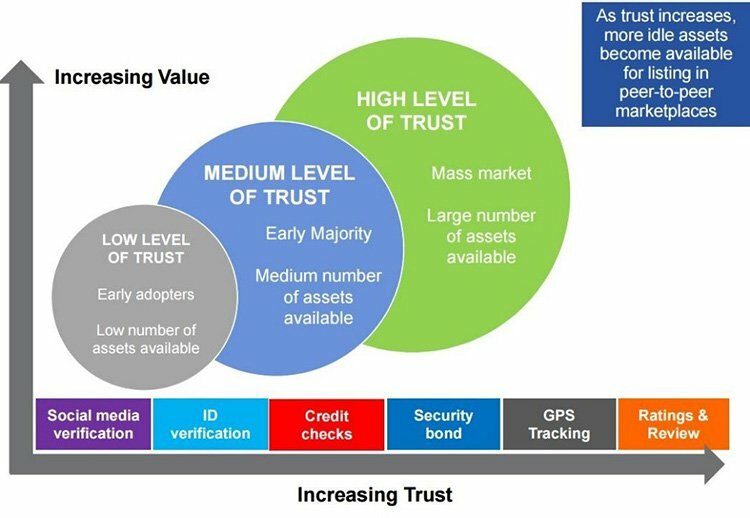 Similarly, using Airbnb, or DriveMyCar.com.au for the first time, encourages people to trust new ways of doing things. If taken to the next logical step, we may soon see peer-to-peer services developing in similar fashion to eBay (now dominated by ‘power-sellers’ who first started as novice users, trying out a new service). eBay now has fully-fledged businesses turning over millions each year, that sell the majority of their goods through the online auction site, as opposed to physical stores or a website. Could we see such market dynamics flourish in the peer-to-peer space? If we do, it will likely mean lower prices for consumers. And if CL8 is the first of the P2P generation, then it could scoop up a significant market share as the industry takes shape and finds its footing. The sharing economy is navigating similar expansion challenges to online shopping, but will likely mature into a billion-dollar industry that seems like it was always part of the furniture of modern internet-ready markets. In five years’ time, we may see a day where it’s not Hilton and Yellow Taxis dominating consumer preferences, but rather, peer-to-peer alternatives such as AirBnb and DriveMyCar, working from decentralised sources of supply and serving market demand with asset utilisation fully maximised.